All the rumors, gossips, and speculation surrounding Google’s Pixel Smartphones are now entirely cleared. Google's latest Pixel and Pixel XL Smartphones are now launched finally. Both are distinguished mainly by the resolution and dimension of their screens. The users will get 5-inch 1080p display on the Pixel and 5.5-inch Quad HD panel on the Pixel XL. Though both devices are manufactured by HTC, but Google takes complete credit for the design. Both models are loaded with the latest Snapdragon 821 processor and boast a specialized version of Android software, which embraces support for the Daydream virtual reality (VR) platform which was announced at Google I/O earlier. At present, Pixel is the only phone having Google Assistant feature. You just need to touch and hold the home button or say whatever you wish to look for, the Assistant perform the said action. It also combines the Google Now on Tap functionality, enabling the user to get the information on the screen, such as a name of a place, and provides extra information, like routes and different shops in that place. When DxMark has given both Pixel and Pixel XL rear camera a score of 89 (the highest ever), there is nothing much to comment about it. Although this benchmark may not be the most consistent measure of great performance but it’s surely a signal of the sensor's potential in the Google phones. It offers a 12.3MP resolution with f/2.0 aperture and large 1.55-micron pixels. Google further stated that its new camera comprises "the shortest capture time on any Smartphone camera ever." The users will also find a very intricate, gyroscope-based video stabilization; however, it doesn’t come with optical image stabilization for stills. Google will offer free endless cloud storage for full-resolution videos and images shot with the Pixel. So, no worries about the storage issue click and shoot as much you want. The advantage of buying Pixel is that the users will get the latest Android updates straight from Google as soon as they are available. The company has also worked on the Pixel's stamina by including fast charging which gives you about 7 hours of power with just 15 minutes of charging. Also, Google has included 24-hour live support, which allows a tech support executive to see exactly what's on your screen and thus help you resolve the issue better. Moreover, the Pixel has pre-installed Google Duo. Apart from the Pixel Smartphone, Google also presented Daydream View headset to accommodate the Pixel for Virtual Reality use. The Daydream View comes loaded with a small motion controller which is so accurate (as per Google) that one can even draw with it. 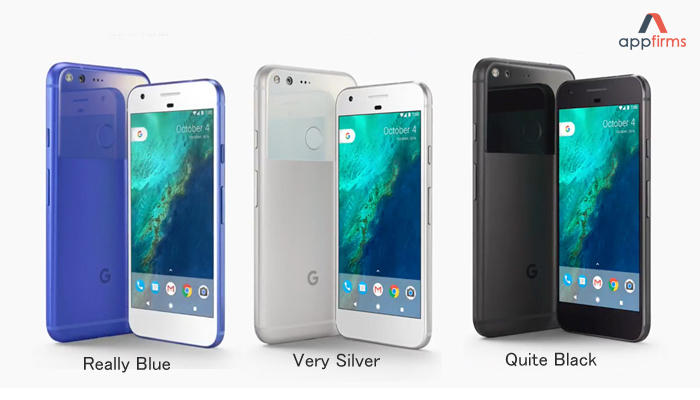 Both Pixel phones are made from aluminum having a glass at the back. This glass is surrounding the flash, camera, and the fingerprint sensor. The Pixel XL is powered by a 3,450mAh battery and the other on has a 2,770mAh battery. Display of both phones is AMOLED, have 4GB of RAM, USB-C, Bluetooth 4.2, an option of 32GB or 128GB of inbuilt storage, and 3.5mm headphone jack. For the smaller 5inch Pixel, the price is $649 with 32GB of storage and $749 with 128GB of storage. While the Pixel XL 32GB version is for $769 and $869 for the 128GB version. Google is offering its latest Smartphones with a color option named officially as Quite Black, Really Blue, and Very Silver. Yes, you read it right these are the official name of the color available for Google’s Smartphones.